Brazil’s cuisine varies greatly among the regions. In the South, there is a high concentration of cattle ranches, resulting in a majority of dishes which are meat-centric. The North Western region has a heavy focus on tropical fruit as well as freshwater fish from the Amazon River. The North Eastern region is characterized by a strong African influence over both ingredients and cooking techniques. It is here where you will find dishes rich in spices and peppers. Of course, Rio de Janeiro has some of the best street food the world has to offer. Brazil has an interesting and rich food heritage, thanks to the culturally diverse communities which have evolved over time. While traveling through Brazil for 6 months, I had the delicious pleasure of experiencing many of the national and regional dishes. 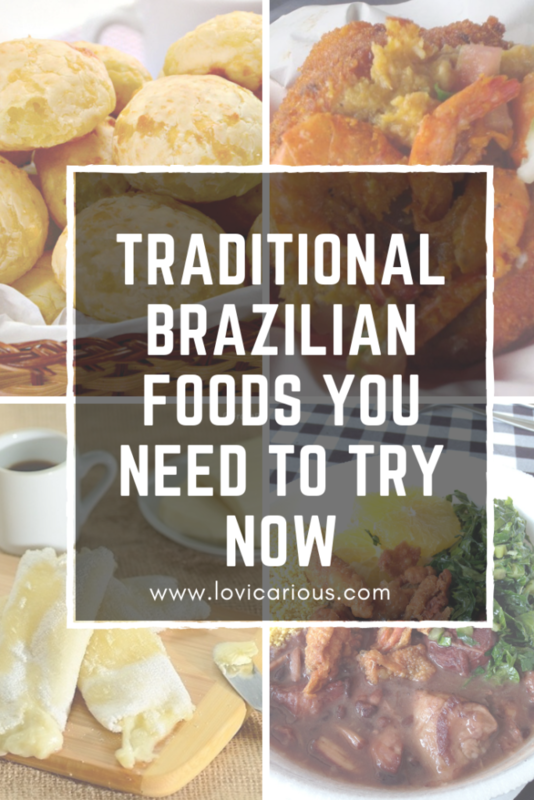 The following is my own definitive list of favorite dishes one must try while visiting Brazil. Enjoy! Get ready to be addicted. These warm rolls are crispy on the outside and all gooey goodness on the inside. Rather than wheat flour, these gluten-free pieces of bread are made with Cassava flour which contributes to the stretchy texture of the dough. When I volunteered with a pousada (bed and breakfast) through the volunteer exchange program HelpX, I helped to make the guests breakfast every morning in exchange for room and board. The women in the kitchen would prepare small versions of Pão de queijo which were about the size of a bouncy ball. However, if you wander the streets of Rio de Janeiro, you can find the larger versions, which I personally find more delicious. I could eat these all day, every day. Acarajé is typically found in the northeastern regions of Brazil, however, I was lucky enough to come across this while in Rio for carnival. There were three women, called baianas, who were dressed in traditional attire of white cotton dresses, headscarves, and beaded jewelry. They lured me to their stand with the fragrant smell of spices and fried shrimp. 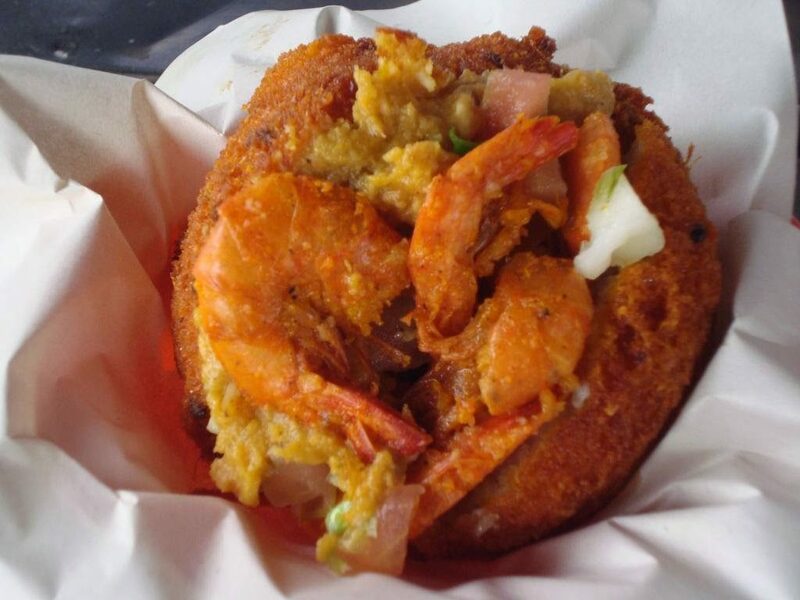 Acarajé is made with black-eyed peas that have been cooked, mashed, formed into a ball and deep fried. It is then split down the middle and stuffed with Vatapá and/or Caruru. Vatapá is a combination of shrimp, crab, cashews and coconut milk that is mashed into a creamy paste. Caruru is a similar spread made from okra, onion, shrimp, and cashews. The Acarajé is then topped with crispy fried shrimp and hot sauce. The pasteis in Bonito are massive! Pasteis are little fried pockets of deliciousness. They are filled with savory ingredients like cheese, beef, chicken, cod, or heart of palm. Occasionally you will find some places that offer a creative flavor like “pizza”. 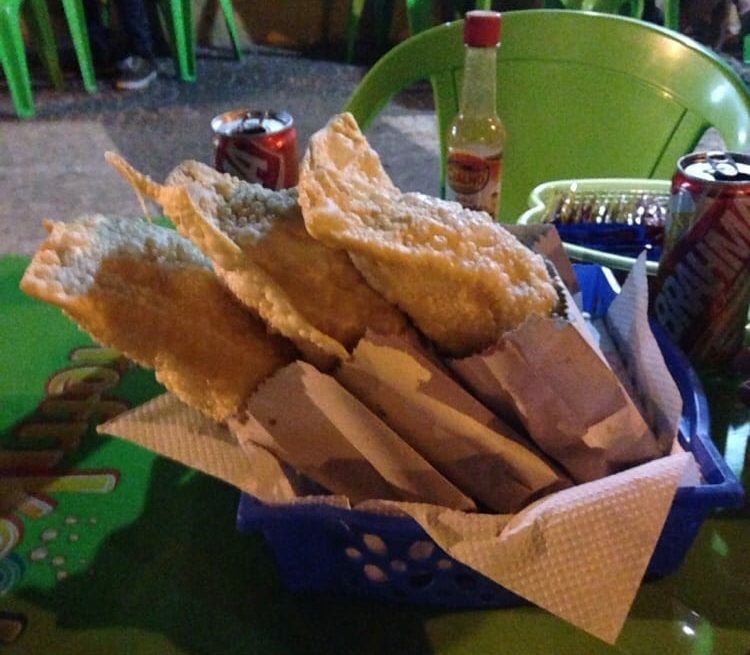 The best pastel I ever had was at a nameless restaurant in Bonito, Mato de Grosso do Sul. I am pretty sure it was a shoe store by day that also served pastels on their sidewalk at night. Pastels can be hit or miss sometimes depending on how fresh the ingredients are and how much filling they use. This place, however, did not skimp. These things were massive and filled to the brim with flavorful juicy meat. Add a bit of hot sauce and perfection. Tapioca is made from the starch extracted from cassava/manioc root. The flour is rehydrated with a bit of water and then pushed through a sieve to produce a fine powder. This powder is sprinkled onto a hot skillet where it begins to melt together forming a solid crepe. 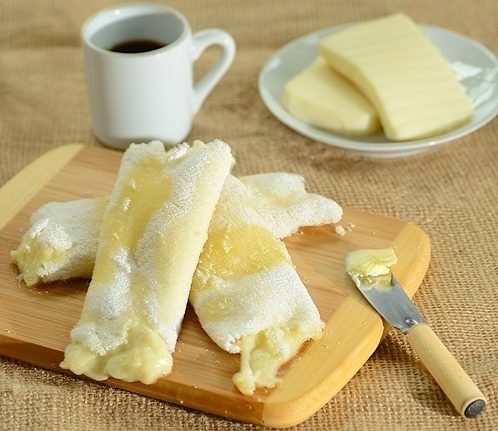 Tapioca can be served sweet with fillings such as condensed milk, coconut, bananas, or jam; or they can be served savory filled with cheese, shredded beef, or chicken. I first encountered this delight during Carnivale in Rio. Food carts lined the streets with caipirinhas, fried snacks, and these guilty pleasures. When I moved to Rhonodonia for 4 months, my host mom would make tapioca nearly every day for breakfast. A teaspoon of butter would be spread over the crepe then rolled up for it to melt. The chewy lightly flavored crepe was the perfect breakfast that never got old. Feijoada is Brazil’s national dish, however, this popular bean stew is commonly prepared in other countries including Portugal, Macau, Angola, Guinea-Bissau, Mozambique, Goa, and India. Cape Verde also has their own West African style of Feijoada which you can read about in our article “Capeverdean Food and Morabeza”. Brazilian Feijoada is typically made with black beans and either beef (ribs, loin) or pork (ears, bacon, sausage, ribs). Depending on the region, the stew may be accompanied by vegetables such as kale, carrots, potatoes or green banana. Finally, it is topped with farofa (fried manioc flour) and served with a side of rice and sliced oranges. The oranges serve to aid in digestion, in case you were wondering. It is a slow cooked dish, and meant to be enjoyed in the same slow and leisurely manner. 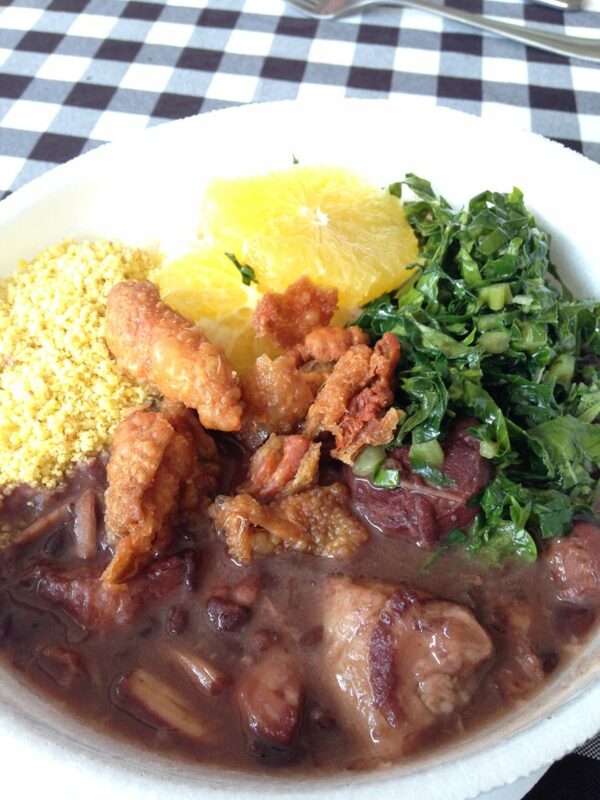 For this reason, Feijoada is normally prepared on weekends to be enjoyed over a long midday meal. My bowl of Tacacá from Tacacá Da Kombi in Porto Velho. been used for centuries in northern Brazil to treat oral conditions such as toothaches. As part of the soup, the jambu numbs the lips, cools the throat and might even make you salivate a little more than usual. Other basic ingredients of the soup are tucupi (broth made of wild manioc), shrimp, and yellow peppers. 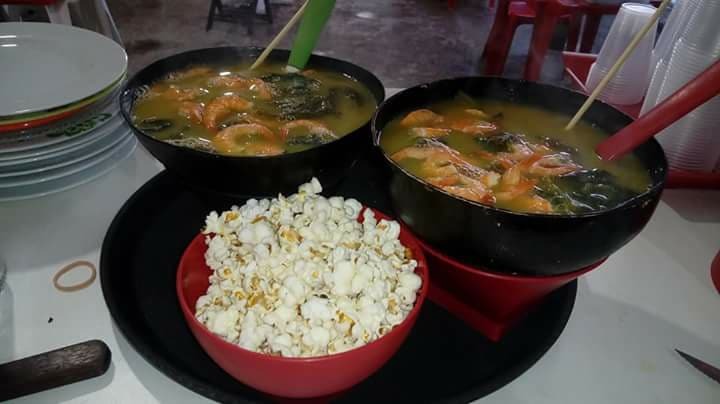 When I tried Tacacá in Rondonia, the soup was served with a side of popcorn. Not really knowing what to do with it, I sprinkled it on top after which they rapidly became little soggy pieces floating in my soup. Tacacá is definitely one of the most interesting things I have ever eaten and wouldn’t hesitate to try it again. I would probably pass on the popcorn next time though. 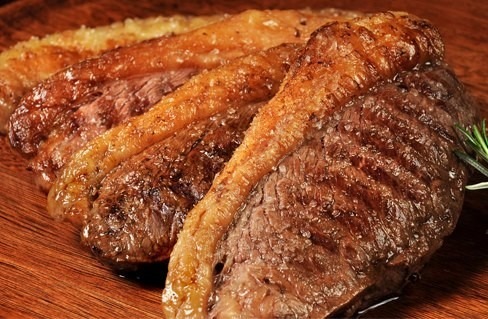 Picanha, in my opinion, is the crème de la crème of Brazilian steak. If you grew up in the states like me, you probably always had your mom removing the fat from your sirloin and throwing them out. (What was she thinking?!) This, however, is not the case in Brazil. Picanha, also called sirloin cap, has a thick layer of fat sitting on top of the meat like a majestic crown. The steak is dusted with coarse salt and thrown on a churrascaria (grill) where it is grilled to a medium rare perfection. A beautiful char develops while the fat constantly injects more flavor into the meat. When cooked correctly, it is the most delicious cut of meat I have ever tasted. The aromatic char, the steak’s perfectly balanced flavor of sweet yet salty, the bit of cooked fat which melts in your mouth like butter… Ugh, take me back to Brazil already! These bonbon-like desserts are so simple, yet so good. Cocoa powder is mixed with butter and condensed milk. That’s it. Those are the only ingredients! Everything is slowly melted together in a pan and then rolled into small balls. As a final touch, these little delights are topped with a topping of your choice (generally sprinkles, crushed nuts or powdered sugar). 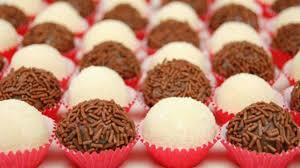 Beinjinho, which translates as “little kiss”, is very similar but coconut is used in place of the cocoa powder. Do you like exotic fruit? If so, you will love mousse de maracuja. 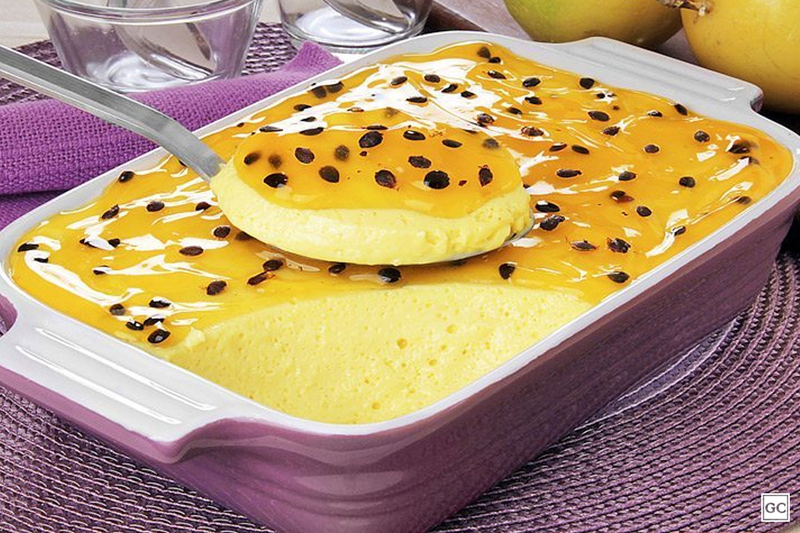 This dessert is a light, sweet and tangy mousse made with condensed milk and topped with the fresh pulp of a passion fruit. Occasionally you can find a different version which is served with an additional layer of chocolate mousse. I have never had anything like this in another country so it is worth a try while you are visiting. Açaí Da Terra in Porto Velho Rondônia has the best Açaí bowls I have ever had (pictured above). years, this fruit has been consumed for centuries by the indigenous communities in northern Brazil, and it is there where you will find the best Açaí na Tigela. Açaí pulp is separated from their seeds. This concentrated pulp is blended with half a banana, Guarana syrup, and ice. 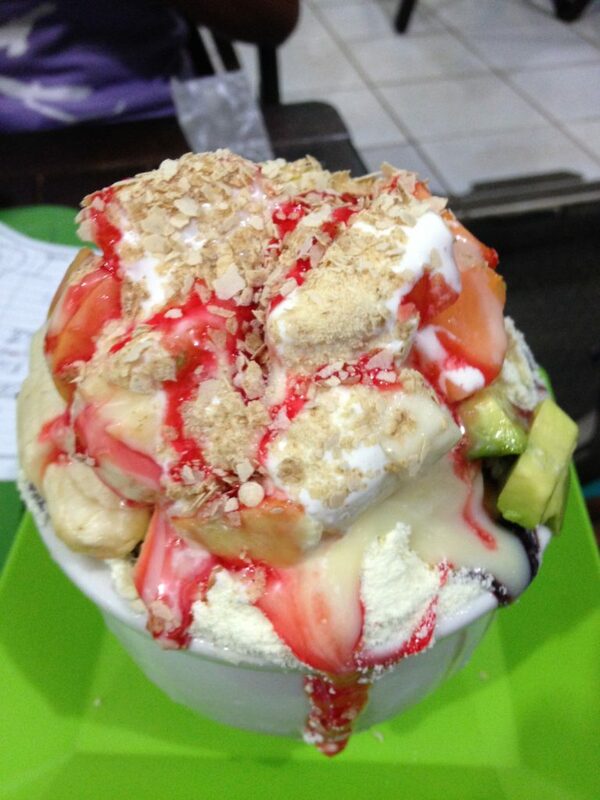 It is served in a bowl and can be topped with a number of sweet toppings including sliced fruit, freshly whipped cream, condensed milk, granola, or chocolate. Many places in the United States dilute the Açaí with other mixed berries which alters the flavor and texture. If you go to northern Brazil, you absolutely must try the Açaí na tigela! Hint: You know the Açaí is good when your teeth are slightly stained purple from the Açaí pulp. Picanha, Cheese Bread and Acarajé are awesome! Picanha is the only one I tried, but I love to try them all! What a fantastic post, I love to learn about local food in different countries. We do too. Trying the local cuisine in any country we visit is always a must for us. 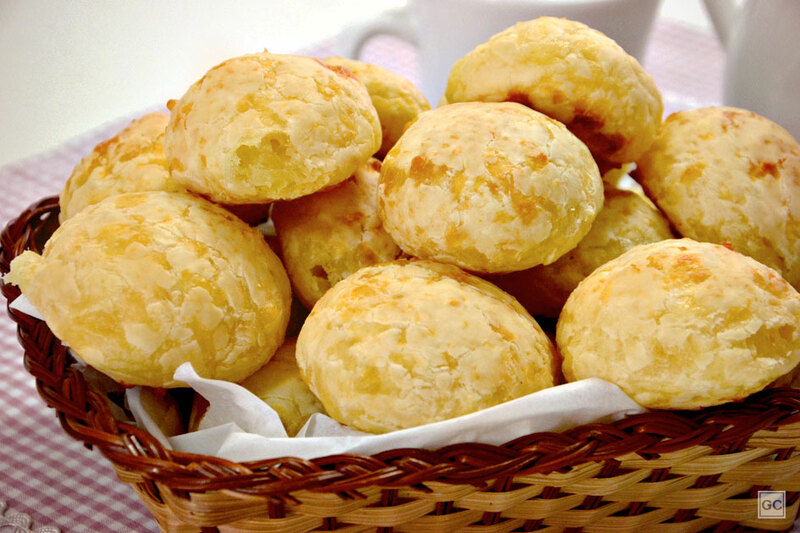 I LOVE pao de quejo and make them all the time at home!! The tapioca looks awesome too… In any case, just waiting for my next opportunity to go to Brazil and try it all in its home! Love the food. And I am definitely drooling in the dessert section. We have been planning a trip to Brazil. Now I know what to eat. So happy to hear that you found our article helpful. Let us know if you need any other travel tips for your upcoming trip to Brazil!